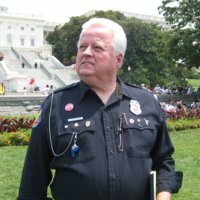 The late Officer Jack McLamb was a member of Police and Military Against The New World Order. He was a tireless advocate for freedom and will be missed by all who seek the truth and desire freedom from tyranny. His book Operation Vampire Killer 2012 is still available for purchase. You need to get this book into the hands of all law enforcement officers, the military, as well as everyone you know. They need to understand what is really going on. ****Officer Jack McLamb does NOT have a website. **** Someone used his name and created a website which he had NO control over. Don’t be fooled by any website claiming to be his. For priority mailing, quantity prices, etc. call (208) 935-7852 and speak with Carol Asher, his former assistant. All $$$ goes back into printing more books.